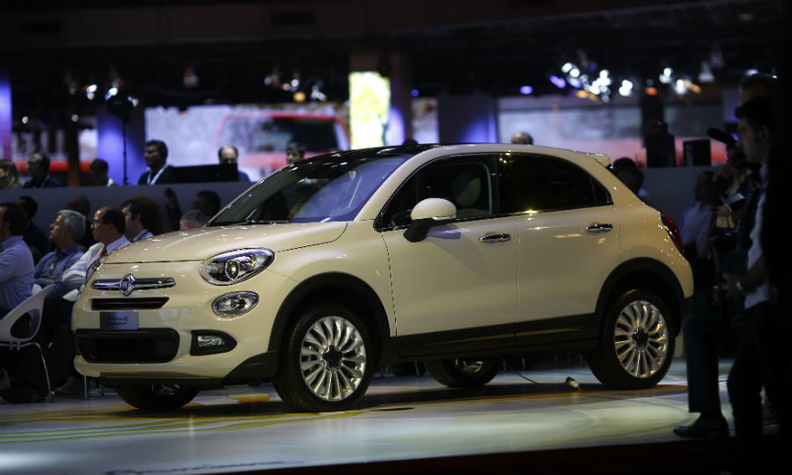 The 500X, shown, will give Fiat a boost in the popular subcompact SUV/crossover segment. PARIS (Reuters) -- While rivals rolled out new models and concept cars, Fiat had little to display at the Paris auto show besides the 500X in what is starting to look like a worrying trend for the carmaker's namesake brand. Following the full takeover of U.S. unit Chrysler, the newly-named Fiat Chrysler Automobiles (FCA) has set out an ambitious growth plan focused on its upmarket Alfa Romeo, Maserati and Jeep brands. Analysts say it makes sense to concentrate on higher-margin premium vehicles that are selling strongly in the United States and emerging markets, but are concerned the group is neglecting a Fiat brand which still accounts for a large chunk of sales. FCA sold 1.5 million Fiats last year, with deliveries of the mass-market brand accounting for 34 percent of the group total. The 500X, which was unveiled in Paris is another variant of its retro-styled 500 minicar. It should help lift sales by adding to the popular subcompact SUV category. IHS Automotive forecasts that Fiat will sell 73,000 units of the 500X next year, climbing to 97,000 in 2016 when its is fully rolled out in 100 global markets. But the car is unlikely to significantly change the face of Fiat's core brand, starved of models and stuck with an aging line-up. "The 500 is getting older and older, the success of its variants has been limited and they lack a competitive offering at a time when Volkswagen, Peugeot and Renault continue to launch new cars," said Sascha Gommel, an analyst at Commerzbank. "Even if the European recovery was gaining momentum, Fiat would definitely lose out." CEO Sergio Marchionne struck gold in 2007 when he chose the 500 hatchback to revive the flagging Fiat marque, selling more than a million in the six years after relaunch. The Fiat 500 is as Italian as a cup of espresso or actress Sophia Loren. It was meant to be Marchionne's answer to BMW's Mini and help drive sales of other models within the Fiat family. But a strategy that got off to a promising start hit a few bumps in the road, not least an economic crisis that pushed car sales in Europe into a six-year slump, from which the sector is only gradually recovering. European sales of the 500 are still high but have come down from their 2008-2009 peaks, despite customized features and electric and cabriolet versions. A rise in buyer incentives in the United States and Europe to boost sales also hints at problems and risks devaluing the product, analysts say. Meanwhile, Fiat dealers say the 500 revamp has failed to rub off on other cars within the brand, some of which are looking tired. Fiat's Punto subcompact hatchback is already nine years old. "Mini did the classic rollout of keeping sales steady over the years by slowly and steadily introducing product variations, but Fiat is not that disciplined," said Jane Nakagawa, managing director at Portia Consulting. "To the average consumer, the variations they have come out with were relatively invisible." Fiat's global market share in the B-segment of small subcompact cars has fallen from 9.3 percent in 2007 to 6.2 percent last year and is expected to dip below that level to 5.7 percent by 2018, according to forecaster IHS Automotive. In the minicar A-segment, under which Fiat's popular 500 and Panda models fall, Fiat's market share is seen falling from around 7 percent to just under 5 percent between 2007-2018. Fiat needed half the time it took Mini or Kia to breach the 40,000 sales mark in the U.S. market. However, Fiat 500 sales peaked in 2012 and fell 18 percent last year, while overall volumes for the Fiat brand dipped 1.2 percent in 2013. The larger five-door 500L was hit by two recalls and the Serbian factory which produces the model was temporarily suspended last month due to "market conditions". "The 500L recall was a bump in the road and we are ready to move on," said Jason Stoicevich, head of the Fiat brand for North America. He said Fiat was on track to have its best sales year in the United States this year since the brand was brought back there in 2011, with sales through September up 8 percent. Stoicevich is betting on the 500X to speak to U.S. consumers who like sport utility vehicles (SUVs), are looking for something larger than a city car, and want a sturdier car with all-wheel drive capability to withstand harsher weather. "This is going to be a real game-changer," he said. "It is the first vehicle we will put on the road here where there really is no reason for rejection in terms of either size or capability." As a group, FCA plans to invest 48 billion euros ($61 billion) over five years to boost sales by 60 percent to 7 million cars. Its ambitions for Fiat are more modest in comparison: sales are seen growing by nearly 30 percent to 1.9 vehicles by 2018, with the brand focusing growth on the Americas and Asia, while aiming to keep deliveries flat in a struggling European market. But some analysts think that will be a tall order, especially if Fiat has to compete with Alfa Romeo, Maserati and Jeep for the heavily indebted group's stretched finances. They also say Fiat's five-year product pipeline of 27 new entries includes few surprises besides remakes of its popular 500, Panda, or Punto models. By 2017, the brand will only feature two or three models in the fast-growing compact SUV segment, they add.